Here’s what else is on his watch-list. 1. What’s on your Must See TV list lately and why? The main thing I watch is sport. It’s been a lifelong addiction. NBA finals on at the moment. That chews ups some productive hours. I’m trying to cut back! I’ve also started watching the latest Alan Partridge show. Steve Coogan is a ripper. Just caught the latest ep of “Unemployable Me.” Thats great. 2. What are your Guilty Pleasure shows? Anything on SBS with a hint of anything raunchy and all things Bachelor / Bachelorette. 3. What show you would secretly love to appear on? I’m A Celebrity Get Me Out of Here. I think everything I say is fascinating! I’m a non drinker and have just started drinking zero alcohol beer so I’m knocking back a couple each night watching the box. Mini magnums go down well also. 5. Who is still on your wish list for Hughesy We Have a Problem and what’s coming up for the show? Russell Crowe, Nicole Kidman, Cate Blanchett, Hugh Jackman to name a few. Shoot for the stars is my motto. But generally I end up with my talented mates. Pete Helliar and Rove drop by in a couple of weeks! 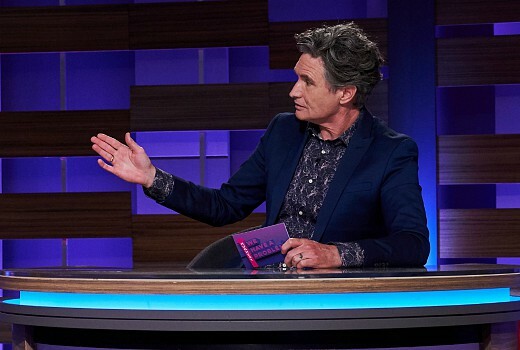 Hughesy We Have a Problem returns 9pm Sunday April 28 on 10.